Today we get to see a head to head showdown of AMD and Intel systems using Gigabyte motherboards. The motherboards are Mico ATX in size, and would be perfect for a HTPC. The boards are model #880GMA-UD2H for AMD socket AM3 based processors and model #H55M-UD2H for Intel socket 1156 based processors. Both boards have built-in video, and an MSRP of $100. While I would recommend using a dedicated video card, having built-in video will save some cash upfront if you need to save up for a video card. I used a card I had on hand, an economical ATI HD5570 1GB low profile card that retails for around $90, perfect for a HTPC. The processors used from AMD are their quad core Phenom II X4 970 BE and Athlon II X4 645, and dual core Phenom II X2 565 and Athlon II X2 265. 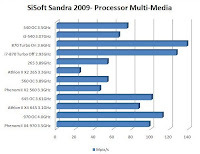 The Intel processors used are the quad core i7-870 and dual core i3-540. The AMD prices as listed below range from $185 to only $76. The Intel i7-870 retails for ~$300 and the Intel i3-540 retails for ~$125. The features of the motherboards are actually quite similar. They both feature Gigabyte’s Ultra Durable 3 with 2oz copper PCB, 50,000hr Japanese solid Caps, and Dual Bios. The Intel based board does however give you 2 PCI-Express 16 slots (1 at 16X and one at 4X) and 2 PCI slots, but no PCI-Express 1X slots. The AMD based board gives you a PCI-Express 1X slot and the same types of video card slots but only 1 PCI slot. It does however give you Gigabyte’s 333 Onboard Acceleration, which is USB 3.0, and SATA 3.0. So from that stand point the 880GMA-UD2H is a bit more future proof. Both give plenty of USB, SATA, and even 1394 and eSATA. Well, they both have plenty of features, and good build quality. But how do they perform? Given both boards are not only from the same manufacturer, but at the same price point, it will be easier to compare performance. So we are able to do a head to head comparison. 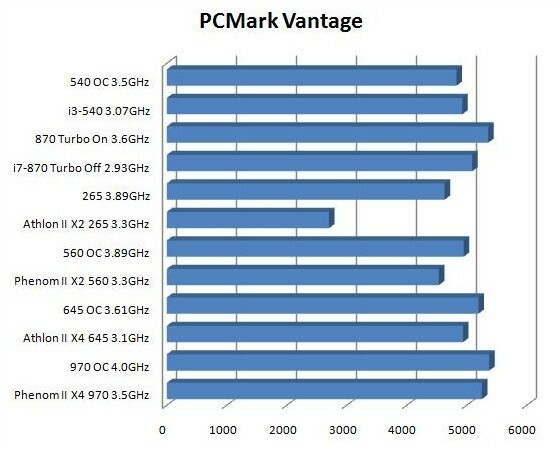 And the reference components used in the benchmarks are the ATI video card mentioned above, and 2 GB Patriot DDR3-1333. 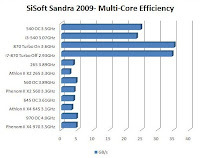 Benchmarks were done with the processors at stock frequency and overclocked. 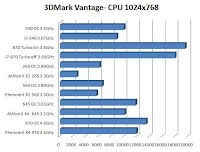 Benchmarks were run using SiSoft Sandra 2009, PCMark Vantage, and 3DMark Vantage. 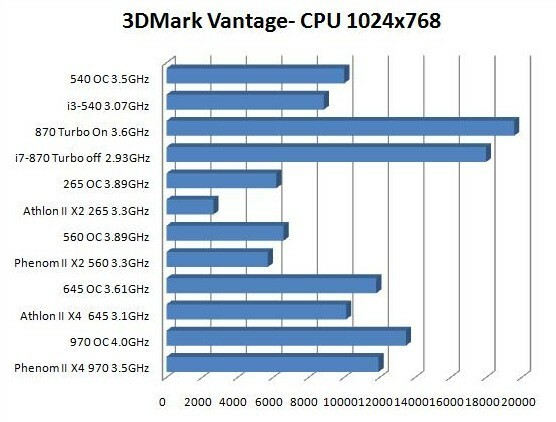 The benchmarks were run at stock frequencies and and overclocked, except for the Intel i7-870. It has built-in turbo boost that will automatically overclock it up to 3.6GHz. So for that processor, the benchmarks were run with turbo boost disabled with a stock frequency of 2.93GHz, and then turbo boost enabled for frequencies up to 3.6GHz. So who was the king of the hill? Let’s find out below. And the results show that Intel is the current King of the Hill. 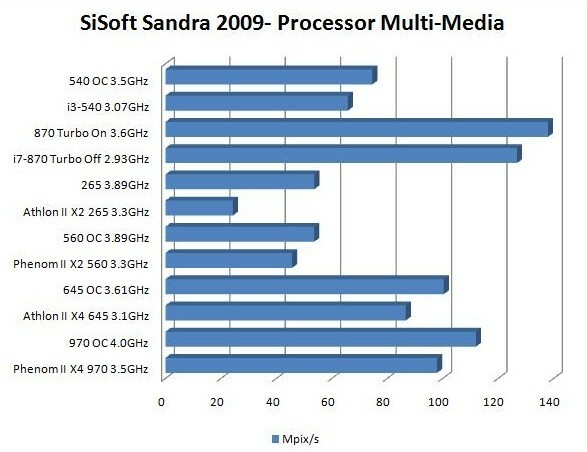 The Intel i7-870 is top dog. If you want the best performance, it has got to be the Intel i7-870. 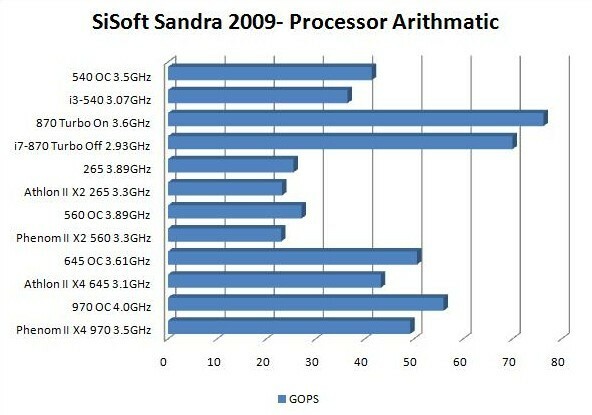 And the i3-540 dual core even beat the Athlon II X4 quad core in some categories. BUT, and there is a big but- Intel is also priced higher. 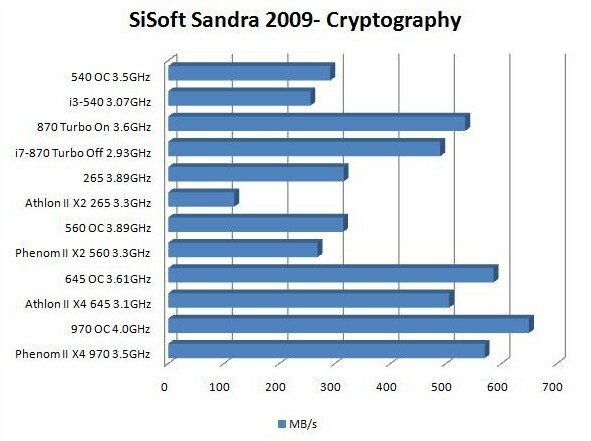 If you take into account the percentage price difference, the crown moves from Intel to AMD in all categories except SiSoft Sandra 2009- Cryptography, and just marginally in 3DMark Vantage- CPU. 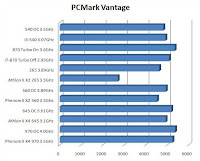 So while Intel is the performance king, if money is a big consideration and you want the best performance per dollar spent, then you better go with the Phenom II X4 970 BE. And whichever processor you go with, either of these Gigabyte boards would make a great HTPC board given their size. 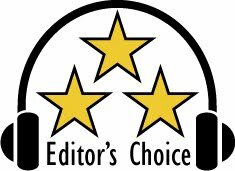 The Intel i7-870 based on performance has earned our Editor’s Choice Award. 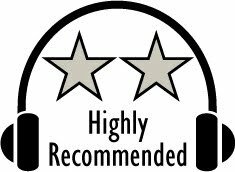 Given the performance and price of the Intel i3-540 and AMD Phenom II X4 970 BE earn out Highly Recommended Award. The Phenom II X2 560 and Athlon II X2 265 earn our Recommended Award. The performance of the motherboards also earned Gigabyte our Highly Recommended Award. 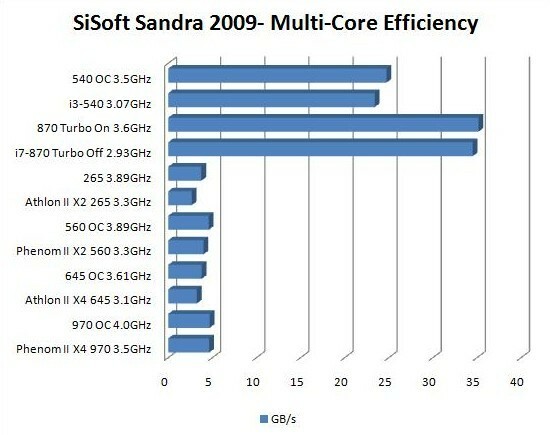 For more info and complete specs, check out their websites at www.intel.com, www.amd.com, and www.gigabyte.com.